We sit down with Evanston teacher Rick Mosher of The Imperial Sound in advance of the band’s October 25 gig at the Montrose Saloon in Chicago. The Chicago-area has no shortage of bands, both new and established. Musicians come and go quickly here, just like in Dorothy’s Oz. Sometimes band members separate, go solo, and then regroup (more or less) as in the case of Smashing Pumpkins, featuring Highland Park resident William Corgan. In the case of The Imperial Sound members Rick Mosher and Kenn Goodman, longtime followers of the Chicago music scene will likely recognize their names from bands such The New Duncan Imperials and The Service, before that. 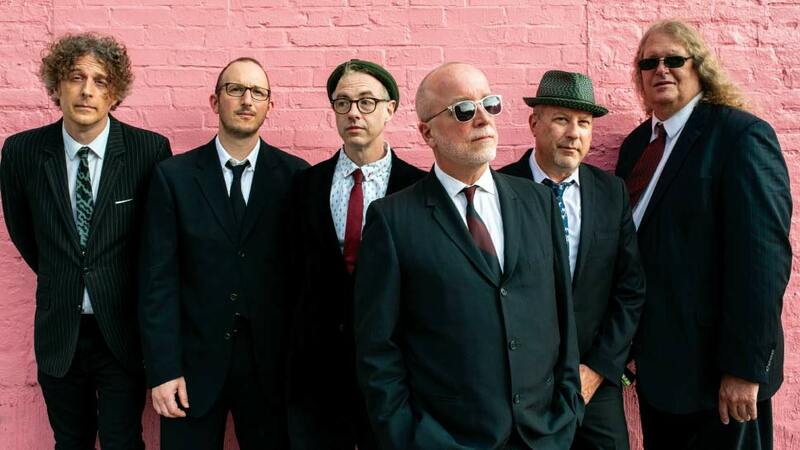 In their new incarnation as The Imperial Sound, along with drummer Matt Favazza, horn section Dave Smith and Dave Winer, and bassist Gary Schepers, Mosher and Goodman are back onstage and on record with the 12-song album The New AM (Pravda Records). I spoke with Mosher, who teaches at the Montessori/IB high school Beacon Academy in downtown Evanston, about the band and the new album. The New AM, the title of The Imperial Sound’s debut album, is a reference to 1970s AM radio. Chicago had two of the greatest AM stations in the ’70s – WLS and WCFL. Did you prefer one of those two, or was there another AM station to which you were listening? I grew up in Freeport, Illinois, which is about two hours west of Chicago. WLS was my jam. I don’t even know if I could pull in that other station, honestly. I listened to WLS pretty much 24/7. When I slept, it was on. Day and night. As long as my parents would tolerate me having it on, I was listening. Would it be fair to say that The New AM could be a reference to a new beginning, a new morning so to speak, for former members of the band The New Duncan Imperials, such as you and Kenn Goodman? I’m big on wordplay. That was sort of why it was chosen, because of what you said. Sort of a third act for us, I guess, having been through a couple of other rock and roll concerns in the past. It was a new start. It really was. You are right, it does have that double meaning. Can you please say something about the challenges and rewards of being the sole songwriter for The Imperial Sound? I’m an absolute control freak, so it really couldn’t be any other way. I’ve been writing songs since I was 10. For me, it’s a closed loop, personal feedback, insular experience and practice. The thing about writing songs that I’ve always felt keenly is that it’s a series of decisions that you make. Deciding where to take a chord progression or a melody or a lyric or an arrangement. There are countless small and large decisions to be made as a song is built. For me, that process is not collaborative [laughs]. I like to be the one making those decisions. A brass section was a necessity in AM radio bands such as Blood, Sweat & Tears, The Ides of March and, of course, Chicago, to name a few. The Imperial Sound features David Smith on saxophone and Evanston resident David Winer on trumpet. Please say something about the roll brass plays in The Imperial Sound. First of all, I’d never written songs for a horn section. I’ve never had horns in a band before. The reason that there are horns in this band is actually part of the songwriting process that I encountered. When I was writing these pop songs, I would get stuck and go … “doo doo doo doo doo doo doo” and come up with a melody that I liked, but it was wordless. I thought it would be cool if there was a nice horn section playing these hooks that would otherwise be vocal. It was a very conscious decision, almost to a fault on the album, to do that on every song. There are horn parts that started out as a song line when I was writing. I sing and record on my phone when I’m writing [laughs]. It was really an outgrowth of the creative process. The thing I will say about finding these two guys (David and David), I would just sing the melody line and they took it and arranged these lines into really spectacular parts, I think. There are some parts on the album that they themselves came up with. Not every single song is mine. The central parts came from the original writing and these guys arranged it. They’re brilliant arrangers. In addition to the core band line-up, The New AM features an outstanding array of guest musicians, including Evanston resident Nora O’Connor, as well as Kelly Hogan, Robert Cornelius, and Peter Himmelman. What’s involved in the process of selecting guest performers? They select us, honestly. We just got ambitious and thought about how great and gratifying it would be (to have these guest artists). When you write a song and you hear someone like Kelly or Nora sing it for the first time, there’s nothing like that. I’m getting chills now just thinking about it [laughs]. It’s so intense, hearing these people sing a song you wrote. I have to say the fact that they’re on the album is by their good graces [laughs] and by their willingness to sing a song. I like to think they saw something in a song that they like and that led them to record with us. They are talented beyond measure. I also have to give some props to Dag Juhlin, who also performs on the album. He and Kenn and I go way back. When you perform Chicago-area shows, do Dag, Nora, Kelly, and Robert join The Imperial Sound onstage? Occasionally. We played with Peter Himmelman at SPACE about a year ago. Kelly sang with us that night. We have a singer named Chloe Orwell who is a member of the band The Handcuffs. She often sings with us, taking Kelly and Nora’s parts. Live, I usually sing a song like “Yesterday,” which Nora sang (on the album) and that’s super-intimidating. I’m a songwriter first and a singer second, maybe even third. Would you mind saying something about having a record label called Pravda Records in the age of Putin and Trump. Kenn and I started that label several years ago. We chose that word simply because it meant truth. Truth, and no discussion about it, is the implication. Neither of us speak Russian and we’re not communists [laughs]. Let’s just say that when we chose that name, the (Berlin) Wall was still up. I stopped being an active participant in Pravda Records’ operations back in the ’90s. If there’s anyone to defend the name Pravda, I’m going to leave that to Kenn. Which subjects do you teach at Beacon Academy, a Montessori high school in downtown Evanston? I teach American History. That’s my main role. I also teach a class called Practical Life. Things like handling a credit card, job applications, and even kitchen and laundromat skills. What to do in the event of a car accident. A lot of things that the students whom I teach expressed a desire to learn. They felt like they wanted to learn these skills because they knew they were going to need to know how to do them and no one’s really teaching them. It’s not really the role of a traditional high school to teach a kid how to make ramen. But Beacon is a Montessori school and we consider that part of our mission. What do your students at Beacon Academy think about having a rock star as their teacher? They don’t. Honestly, I don’t walk in with my rock star hat on. I walk in with my teacher hat on. Once in a while, to freak them out, I’ll show them a video I’m in or play them a song I recorded just to give them a glimpse behind the curtain. But I don’t think it matters to them. The other thing is, what I play is geezer rock as far as they’re concerned. That’s their term, not mine. Even if they knew I was in a rock band, it would probably be basically a big “meh” [laughs]. Do you have a favorite Evanston dining or night spot that you like to frequent? I love the Unicorn Coffee Shop. I go there a lot to get work done. It’s a little place on Sherman. For nightlife, I like SPACE quite a bit. After work, once in a while you’ll find a teacher or two at Bangers & Lace.